According to my incredibly scientific calculations, it looks as if there are 7 theatres remaining in the recap of theatres I visited and photographed in 2011. Honestly, I am pretty ready to be done with these posts as I am eager to move on to something else, so I am going to do my best to consolidate the remaining 7 into this and one additional post. #11 of '11 is the aptly titled Unique Theatre in East Los Angeles. I had wanted to visit the Unique for quite a while after seeing a Flickr friend's photograph of it in all its glory. For as often as I take the 60 into downtown, it wasn't tough to hop off a couple exits early to experience the Unique. Like most locations, time of day -- as well as time of year -- is critical when trying to get the best photograph. This early May trip to East LA made for a series of photographs starring a (some would say rare, but not me!) blue sky and white clouds in exchange for vibrant colors and detail. The 1920s Unique has been a dollar store for some time, but from what I can see and have heard, many of its features have been preserved (by "preserved" I mean "not completely obliterated", which is a lot to ask, apparently). The fact that the (horribly ugly) "Unique Dollar" sign is on a board in front of the original gives me hope that there's something amazing underneath. Unfortunately the sun to cloud ratio wasn't balanced enough that day to get good detail on the blade sign. 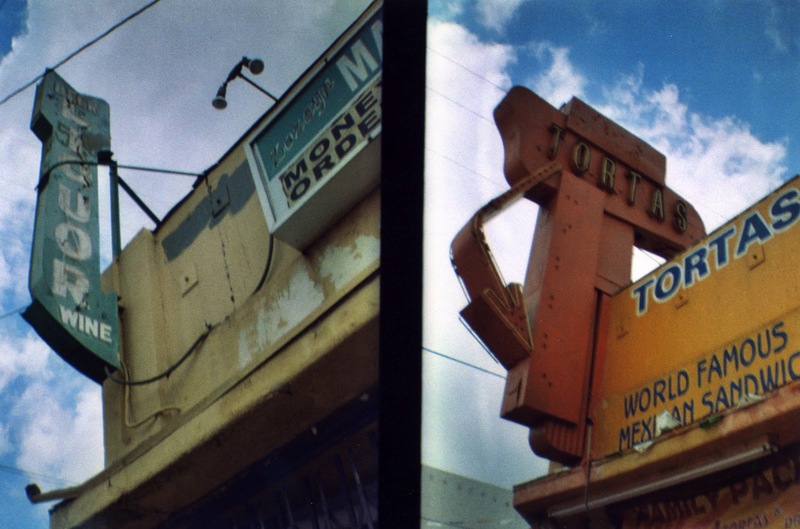 Here's another image from down the street/around the corner of some rough looking neon signs. Revisiting these today, I realize I need to get off at Gage more often. The Unique is on East First, just north of the 60 freeway, in a pretty interesting old neighborhood. 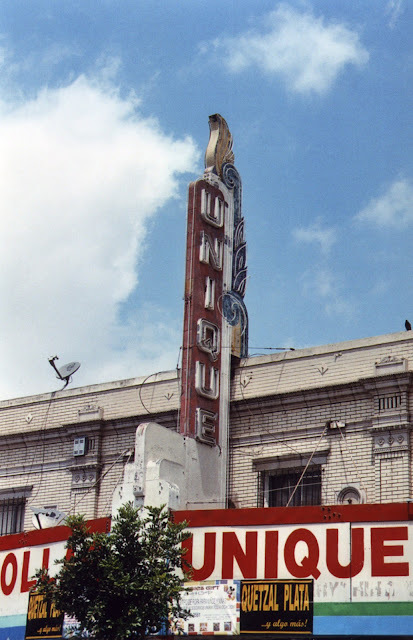 Theatres 12 and 13 are a trip back to Part 2 of this series of posts, Inglewood, CA. I can't say it enough.... I love Inglewood. I plan on a future post focusing on my non-theatre images of Inglewood, of which there are many. The Academy, located at 3141 West Manchester, opened in the fall of 1939. 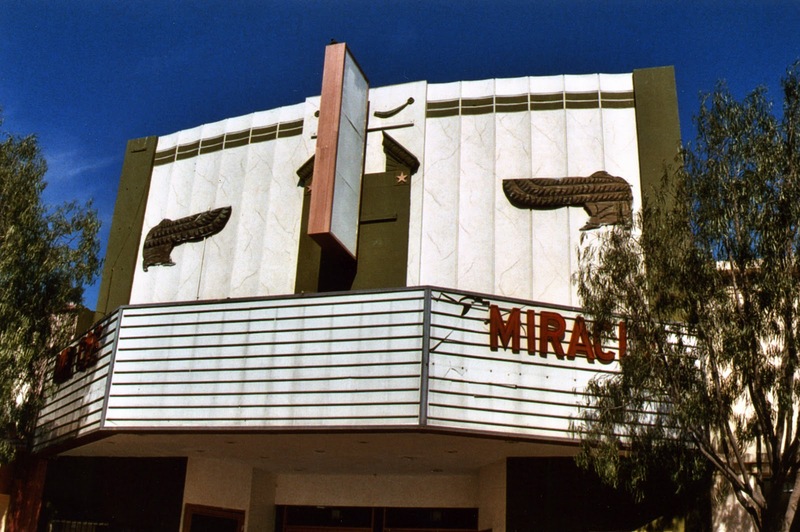 The theatre was originally designed by renowned architect S. Charles Lee to be the home of the annual Academy Awards ceremony, which unfortunately never happened. 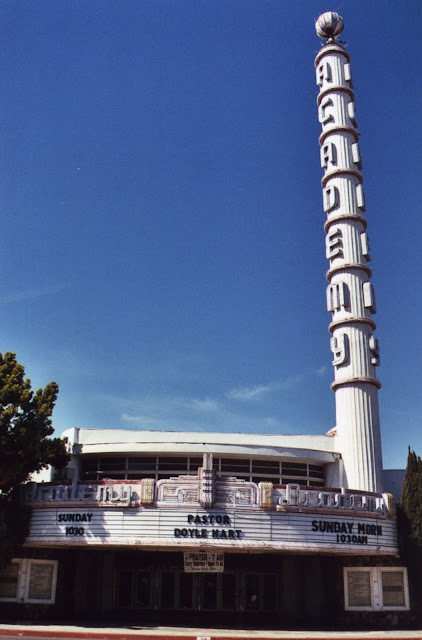 Movies were premiered and exhibited at the Academy until 1976, when it (you guessed it!) became a church. It is a lovely location, and well taken care of by pastor Hart and his congregation. I was told that the tower is illuminated only occasionally, what I wouldn't do to be nearby on one of those occasions. Less dynamic in history and aesthetics is downtown Inglewood's Ritz Theatre. Though it was built in the 1930s, like the Academy, it is rather non-descript and not the kind of place I get particularly excited about. It was a cinema, then a church, and now it's vacant. The end?